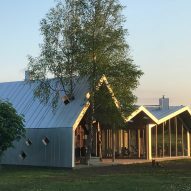 Peeter Pere and Eva Kedelauk have covered a new sauna and an existing traditional wooden smoke sauna, in Varbola, Estonia, with a zigzagging aluminium roof. 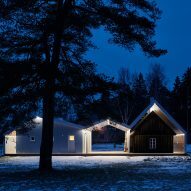 Architects Pere and Kedelauk designed the modern sauna to stand alongside a wooden sauna that sits on a farm, surrounded by a cluster of sheds and woodland, in Varbola, which is around 35 miles south of Tallinn. 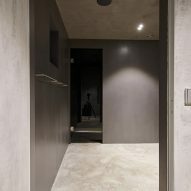 "The old, already remodelled smoke sauna was the catalyst of the design," said the architects. "A separate new entity would have left the old building in a sad state, thus began the idea of building on and around it, packing the old with the new." From certain angles, the plain metal elevations and roof of the new building blend with the existing nearby sheds, but the two open ends reveal the combination of new and old. 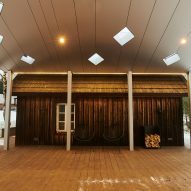 Sitting atop a platform of wooden decking, the sauna buildings and the roof structure have been conceived as two separate, layered elements. 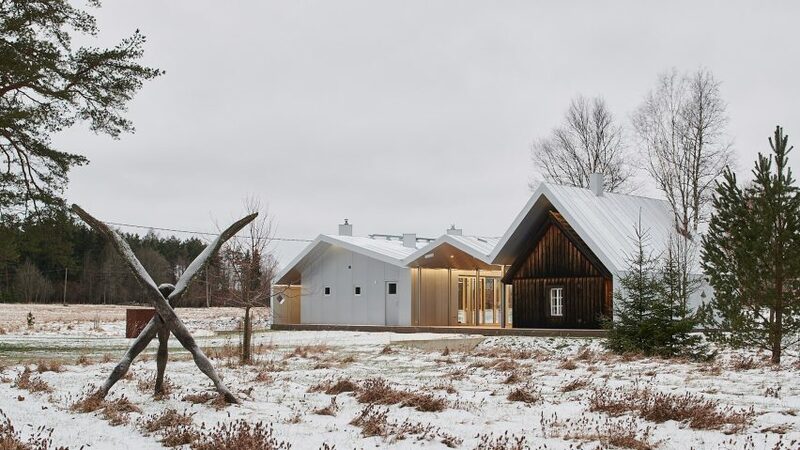 To the east, the steep pitch of the new roof follows that of the original sauna building, before dropping to bridge an open walkway and then becoming the roof of the new sauna. 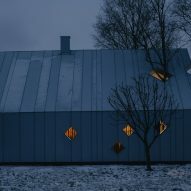 The gaps between the roof and the sauna buildings have become walkways, illuminated by strip lighting and diamond-shaped openings, which appear throughout the structure. Skylights have also been placed in the roof to allow existing birch trees to continue to grow. "There are many different layers to this little building," said the architects. In the centre of the plan, thin steel beams frame the open space between the two saunas, which can become a seating area during warmer months. 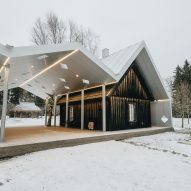 "The area between the two buildings connects the surrounding landscape, the sky, and the old building, which become an inseparable part of the sauna complex", described the architects. 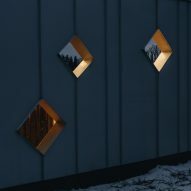 The new sauna building itself has been split into "opposing sides", one housing a dark sauna room and the other a much lighter space with a fireplace and a glazed wall for overlooking the surrounding landscape. 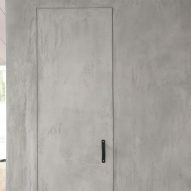 Pere has previously worked with the idea of a metal, shell-like structure for a summer kitchen on a farm in Estonia. Photography is by Tonu Tunnel, except where stated.